A fellow Arabic teachers of the younger years at our Islamic Saturday school has shared many of her ideas and games with me on how to teach and review the Arabic alphabets. This game is a fun way to reinforce the learning of new letters. 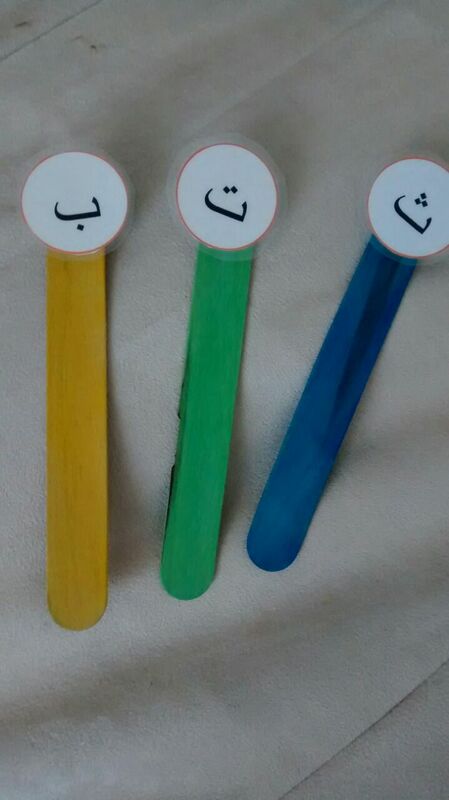 The children are given lollipop sticks with letters (laminated and velcroed) on them corresponding to the letters they are learning that week; eg: ba, ta, tha. The teacher calls out a letter and they lift the stick they think is correct. This entry was posted in Games and tagged activity, arabic, arabic alphabet, arabic alphabets, arabic games, arabic learning games, class game, classroom, craft activity, early years, early years learning, game, games, Juz Amma, Juzz Amma game, language, quran, Quran curriculum, quran syllabus. Bookmark the permalink.